CarSelfScan - unique in the Netherlands! 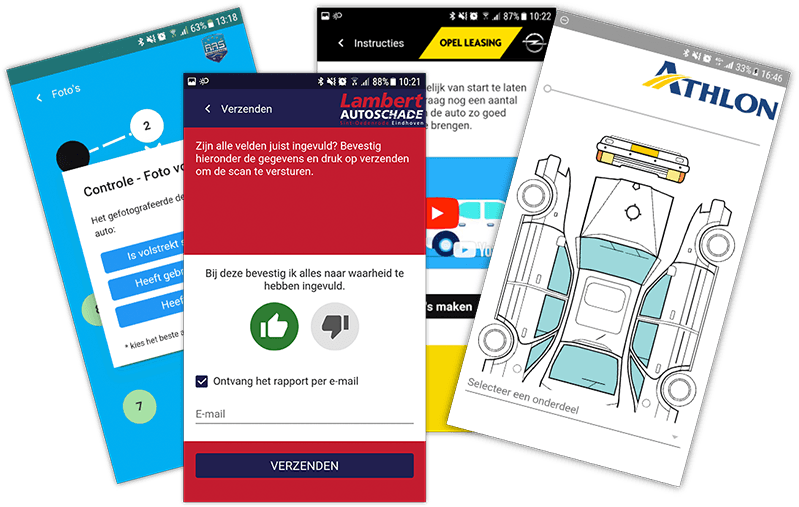 This tool allows non-professionals to draw up inspection reports for their car. Do you not want to dissatisfy clients about the settling damage(s)? Do you want to get rid of the discussions and suspicions? Is a higher promotor score your aim? Stop the hassle and give drivers the chance to record the damage(s) themselves. In their own time and at their own location. The CarSelfScan makes it possible, read more. We know you want to make the handling of contracts easier. Drivers also want that. We have created an app with which everyone can do a good inspection. It is a mandatory route, but it can be done at any place at any time. That makes drivers happy and already saves the first irritation. The CarSelfScan app is delivered entirely to your liking and layout, there is no other option. It suits you and your customers. It always provides a professional report that you can settle and record easily and profitably. More autonomy, more transparency, more speed and more quality. It fits the current time. In fact, your customers expect it from you. That’s why the CarSelfScan app delivers that standard. Use it to keep workshop turnover in-house and add more. As an extra we give you the opportunity to offer cars earlier and with better focus. Upstream Remakreting is what we call that. An offer within the Remarketing Pro platform. Because whoever is earlier earns more. With this combination, you will easier find buyers and bidders. A tool to have non-professionals (drivers, hikers etc.) draw up car inspection reports. Setting transport in motion happens in one go. Interim checks have thus been rapidly introduced. The app connects with the Inspection platform, so handling and organizing are easy to manage. Custom application to carry out an inspection or damage assessment with your own smartphone. Very simply, as a claims handler you create access, check your reports, and settle them without discussion. Then add new inspections on the same car and analyse the differences. It makes the life of a claim handler much easier and at the same time you meet the wishes of many fleet owners (secondment agencies for example). Enter your details to download the CarSelfScan White Paper and/or receive more information.